The John Spalding Library in Wrexham hosted the North Wales Libraries Partnership (NWLP) workshop “Search is more than just Google”. Delegates from public, government, academic and NHS libraries gathered together to look at the effect of mobile technologies on search, open access, getting better results from Google and alternative search tools. The consensus reached during one of the breaks was that Cyril, one of the library’s residents and pictured on the left, should have ignored Google’s nutrition advice and gone for the more authoritative sources available in the library and on the web. If only he had waited and attended the workshop he would have known exactly where to look! There was much discussion on how mobile devices change how we can search – not always for the best – and there was concern, as usual, over how much we willingly give away about ourselves to services such as Google and Facebook. Open access was debated in the afternoon along with possible directions for academic publishing. 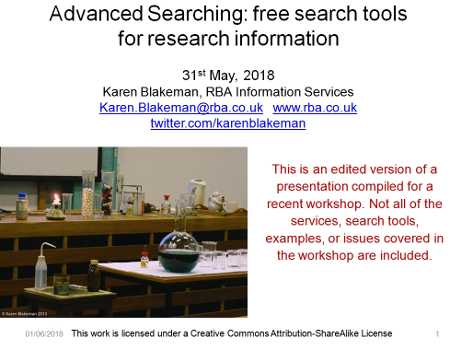 An edited set of the slides is available on authorSTREAM at http://www.authorstream.com/Presentation/karenblakeman-1856150-search-google/ and Slideshare at http://www.slideshare.net/karenblakeman1/search-is-more-than-just-google. The Top Tips that the group came up with included some of the usual advanced Google commands but others concerned cloud computing and social media. Here they are. 1. Back up your stuff. Having your data hosted in the cloud means you don’t have to worry about it disappearing when your laptop or server crashes. But what if your cloud service goes under or your account is deleted for some reason? Have you made a local backup of your essential files and treasured family photos? One of the participants mentioned the Library of Congress digital preservation toolkit for preserving family memories (http://www.digitalpreservation.gov/personalarchiving/). 2. Private browsing for “un-personalising” search results. If you want to make sure that your results are not being influenced by past searches and browsing behaviour, find out where the private browsing option is in your browser (in Chrome it is called Incognito). This ignores all cookies and past search history and is as close as you can get to unfiltered results. 3. Change the order of your search terms to change the order in which results are listed. This is an old trick but still seems to work. 4. Use advanced search commands such as site:, filetype;, intext:, to focus your search. Some of the commands are available not just in Google but also in Bing and DuckDuckGo. 5. Create “newspapers” of articles mentioned on Twitter, Facebook, Google+ or news sites by using services such as Paper.li (http://paper.li/). These can be generated from hashtags, keyword searches or your own Twitterstream. Have a look in the Paper.li news stand to see if someone has already created a paper on your topic. Paper.li automatically compiles the newspaper but there are other services such as Storify (http://storify.com/) and Scoop.it (http://www.scoop.it/) that enable individuals to curate the content that appears in their personal newspaper. 6. Guardian Data Store for datasets and visualisations relating to stories in the news (http://www.guardian.co.uk/data). This was so popular that it was mentioned twice for inclusion in the top tips. What people liked about this is that the source of the data is always given and there are links to the original datasets. 8. Google Reading level to change the type of results that you see. Run your search and from the menu above the results select ‘Search tools’, ‘All results’ and from the drop menu ‘Reading level’. Options for switching between basic, intermediate and advanced reading levels should then appear just above the results. Click on the Advanced option to see results biased towards research. 9. Beware fragmented discussions. Articles can be posted and reposted in many different places: blogs, websites, LinkedIn, Facebook etc. with the result that potentially useful and informative discussions are dotted all over the place. Learn how to locate fragmented discussions in your subject area and where they are likely to occur. 10. Try something other than Google. Take a look at the slides for a few(!) suggestions of what you could use.